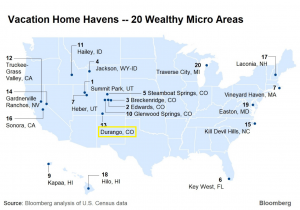 Durango has made it’s way into the top 15 “Best Places to Own a Vacation Home in the U.S.” according to Bloomberg. 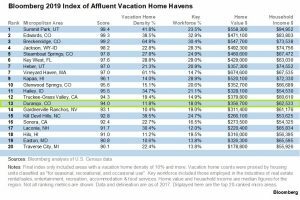 The Bloomberg looked for small pockets of wealth in more than 500 areas across four equally weighted metrics: vacation home stock, share of the workforce employed in real estate and recreation-related industries, home valuations and household income. The final index is comprised of 70 micropolitan statistical areas. A micropolitan statistical area includes one main urban center with a population of at least 10,000 but fewer than 50,000 people, at least one county and all designated hamlets, villages and townships. To access the full data set on the Bloomberg terminal, click here. For more information on Purgatory Resort or Durango area homes, condos and townhomes, please contact us. We look forward to speaking with you.